Are PCs more analog than digital? In this posting I reprise an article I wrote for the original version of "The World is Analog" on September 4, 2007. Some of you may be considering a do-it-yourself (DIY) PC project during your spare time over the holidays, so you may benefit from some of my experiences last year. Other helpful sites for a PC DIY project are Tom's Hardware and Extreme Tech. Maybe I am biased (sorry... analog pun :-)), but based on my experience this past Labor Day weekend... I have to say that PCs are more analog than digital. I built a new PC over the weekend, based on an Intel Core-2 processor. Take a look at this cooling tower that comes with the boxed 65nm CPU. 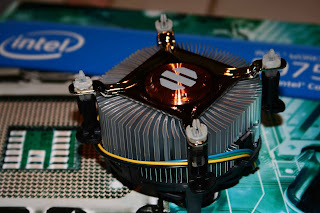 There is a copper heat spreader, attached to a cylindrical heat sink with many fins, all topped off with a cooling fan. It is pretty amazing to me to see what it takes to keep the chip from melting down. It made me think about the "low-power" design techniques that must have gone into the SoC, and how this has become such an important issue in IC design and verification flows. You can find new articles on the topic almost daily, from EDA vendors and designers alike. The Magic Blue Smoke blog is one good site to check out. But, in the end, making the PC work relies on thermal management like this cooling tower... and that's definitely an analog designer's creation. The tower is just one part of the thermal management system, along with front & back case fans, a separate fan on the graphics card, heat sinks on the rest of the chip set, etc. The distribution of power to the various PC components, also an analog design problem, became an issue for me when I overlooked the need to attach a second (2X4) power connector along with the main (2X12) connector to the motherboard. Low power indeed!! I needed a 2nd PC to read the PDF installation guide to discover my mistake on that one. Finally, I got the PC to boot up but with no sound. Ugh, another analog problem. I haven't solved that one yet, but I'm sure it will be nothing compared to the problem of porting my old data files and programs to the new PC. Now that's a software problem!! But I'll save that for another time. Ah the joys of putting together your own computer :D.
But I have to say that in the past year I switched to Mac, and I haven't looked back since. Ever had any experience with them? A Mac? Funny thing is I was just struggling with my wife's old Power Mac G4 last week. I am no Mac O/S expert, and all we were trying to do was transfer her iTunes over before we gave the old machine away. The darn thing had problems booting up, and the MoBo battery was dead... but I jumpered in a power supply, got it up on our home network and thought we were good to go. But before I could finish I had to move the Mac to another room. When I tried to boot it up again it was totally DOA! What was formerly a very loud set of fans wouldn't even come on. Nothing.. no front panel light.. NOTHING! The engineer in me was now determined to figure this out... but my wife was willing to let it go. We gave it away to a Mac nut for $10.